Now, those recordings are being released across 61 Days in Church. Beginning today (Fri, Sept 1st), fans will have access to 30 initial live recordings from various stops across North America. Then, subsequent releases through the end of the year – including some catalogue and cover songs as well as songs inspired by events that happened while he was on the road – released chronologically to complete the list. The tracks will initially be released only on the Apple Music platform for a two-week period before being made available on all streaming services. 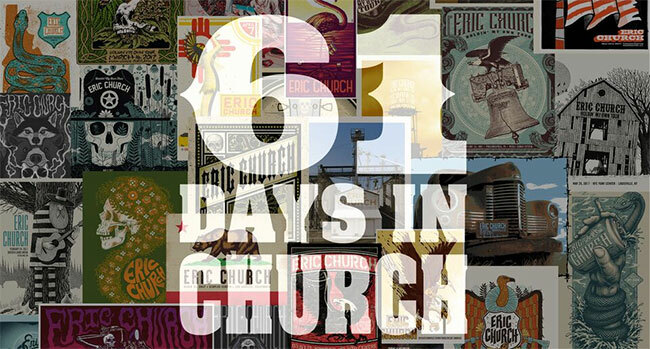 With the unique, individual tour posters from each tour stop serving as the artwork for each week’s release, 61 Days in Church drops just as fans can see a different show from Church as he takes the stage in Tahoe this Labor Day weekend for two sold-out nights at Harvey’s Lake Tahoe Outdoor Arena.